Ann Arbor's Argo Cascades on the Huron River received state and national honors. It seems Argo is continuing its winning ways. Although the Argo Park in Ann Arbor has nothing to do with the Oscar-winning movie that goes by the same name, it's still gaining statewide and national attention lately. The Argo Cascades on the Huron River is a popular destination for kayakers. Courtesy of city of Ann ArborThe city of Ann Arbor has won the 2012 Michigan Recreation and Park Association's Park Design Award for the Argo Cascades feature along the Huron River.The annual award is given to MRPA member organizations for outstanding work in the areas of facility and landscape/site design. MRPA is a statewide nonprofit association representing the parks and recreation industry with a membership of nearly 2,000 professionals. "It is an honor to be recognized by MRPA for the Argo Cascades," said Colin Smith, the city's parks and recreation manager. "Many elected city officials, staff and departments worked together to make the Argo Cascades a success. This project addressed challenges and, at the same time, created an opportunity to improve the recreational experience for people on the Huron River." The Argo Cascades also received a "Frontline Park" designation for the month of March by the City Parks Alliance, a national organization. That honor is reserved for projects that demonstrate inspiring examples of urban park excellence, innovation and stewardship. The Argo Cascades is now highlighted at www.cityparksalliance.org. Ann Arbor completed the Argo Cascades project on the Huron River in May 2012 with the $1.17 million reconstruction of the bypass channel around Argo Dam in the old millrace. 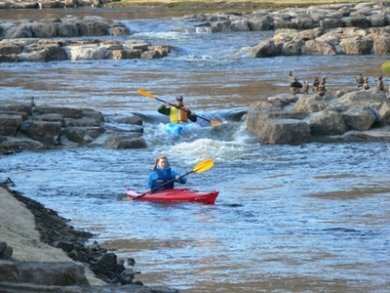 For the first time since 1830, when the channel was built to power mills, the section of river became free-flowing with a cumbersome portage removed and transformed into a series of nine drops and pools for people in tubes, rafts, canoes and kayaks. Other new features include a wider and paved Border-to-Border Trail section and pedestrian bridges installed at each end of the millrace. "The Huron River in Ann Arbor is now a fun and exciting destination, more than ever before," said Canoe Livery Supervisor Cheryl Saam. "The number of livery customers paddling on river trips has basically doubled since the Argo Cascades were built; and the Cascades has allowed for more recreational opportunities such as tubing and rafting." If you haven't already, when the weather warms up, Ar-go check it out.